Two teams with equal points in South Group of the NatWest t20, Blast, Hampshire and Glamorgan, will meet again for enhancement of their status on the table. One among the bottom line teams of the North Group in the NatWest t20 Blast, 2015, Nottinghamshire, will be fighting next with the no.2 squad, Worcestershire. 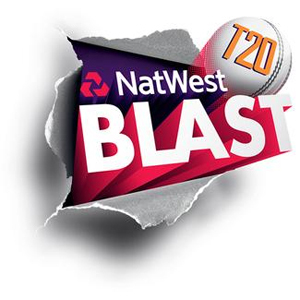 The ruling team of the North Group in the NatWest t20 Blast, 2015, Warwickshire, will play their coming match against the team at the bottom, Debyshire, next. Two teams among top six in the North Group of the NatWest t20 Blast, 2015, Durham and Leicestershire will be in the park next to enhance their positions. The bottom line team of the South Group in the NatWest t20 Blast, Middlesex, will do their best to improve their rating when they meet no.3 unit, Sussex next. The no.8 team in the South Group of the NatWest t20 Blast, Surrey, will look forward to improve its position when they meet the no.6 unit, Gloucestershire. Two teams fighting for upgrading their position in South Group of the NatWest t20 Blast, Somerset and Glamorgan, will face each other in the forthcoming game. One among the bottom line teams in North Group of NatWest t20 Blast 2015, Northamptonshire, will take over the no.4 side, Nottinghamshire, in the coming game. Two super teams among top three of South Group in the NatWest t20 Blast 2015, Essex and Hampshire will be face to face for the second time in the event. Lancashire v Warwickshire NatWestT20 match prediction and betting tips.